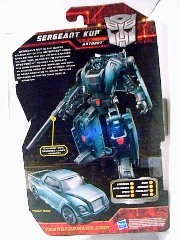 Sergeant Kup is the oldest soldier any of the Autobots know. Even before the war he was a career military �bot, dedicated to defending Cybertron against all threats. His long service has supplied him with an endless array of war stories, which he never hesitates to share with his comrades no matter what else is going on. Kup was never a character I really enjoyed during the 1986 movie. He didn�t do anything terribly exciting in my opinion, and he had a quirky alternate mode. Then I watched Season 3 of the G1 cartoon and my fondness for the character grew. When Kup was announced for release in the Generations line, I hesitated to pick him up initially, but knowing he would nicely complement Hot Rod, Springer, Blurr, etc. in my Season 3 Classics figures, I just had to have him. I can safely say that I�m not disappointed by this Transformer at all. 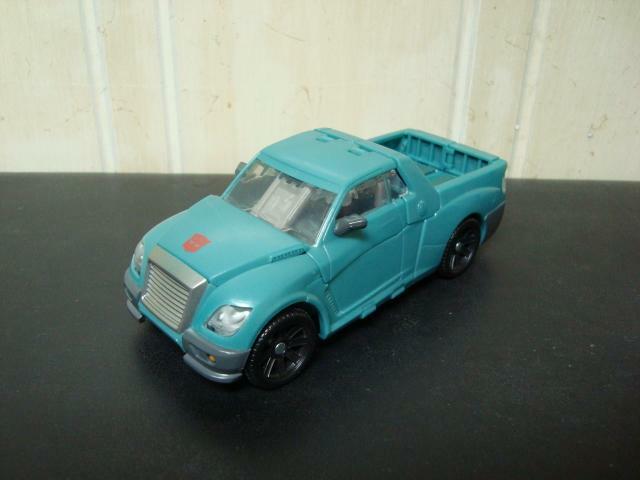 Kup transforms into an older-style pickup truck that reminds me heavily of a Chevrolet SSR. It�s a more modern pickup truck with a vintage look, and I think the design fits Kup well. The truck mode is mostly a dull green color (I don�t even know if there�s a true color name for this) that is accented with some grey on the bumpers, black wheels, a silver grill, and clear plastic windows. A red Autobot symbol adorns the front of the hood. The molding is done well and there aren�t many panel lines, which is nice (Universe Ironhide and Ratchet I�m looking at you!). The headlights and taillights are clear plastic, which adds some depth to the vehicle mode. The rear taillights are also designed well enough to give the truck a more sporty look. The bed of the truck has some nice detailing too; it is a darker green than the rest of the truck and also has some texture in the paint that was used. This is a really nice touch and mimics those spray on bed liners that you can get on your actual pickup trucks today. I really want to point out some cool features in vehicle mode. First, there are a couple different spots to hook Kup�s musket to: two C-clips are on the top of the truck, or you can store the musket underneath and the end of the barrel acts as a second tailpipe. Both uses for the musket work well, and clipping it on top doesn�t even look goofy; it actually makes him look like a military rifle truck. Also, due to Kup�s transformation (or maybe this was intended, who knows) the tailgate of the truck flips down! These panels lock together and end up being Kup�s heels in robot mode, but it�s nice that they work as an actual tailgate. Overall Kup has a great alternate mode, and a pickup truck is a nice addition to your currently car saturated Autobot collection. Kup�s transformation isn�t too tricky, and can be quite fun once you get the hang of it. Getting him out of vehicle mode is the easy direction, as there are no little tabs to get locked into place. Going back to vehicle mode is another story since the door panels can be a royal pain to get back into place, and the hood movement can be problematic. Mine never seems to slide right into place without a little urging, and I�m afraid someday something will snap (possibly my sanity). Even though this hood sliding can be tricky, when you�re putting him into robot mode, it is really slick. There�s some hidden mechanics and springs moving in there, and a few other parts slide accordingly as the hood/top of car backpack is positioned correctly. It�s a cool transformation part, and saves having to move multiple parts separately. However, there have been some reports of the chest frame being very weak and one part in particular snapping during transformation (Rookwise is on his third Kup from this happening). The Kup I have seems to be quite solid, but I'm curious to see how it wears over time. After robot mode is achieved, Kup is a wonderful representation of his G1 character. Aesthetically he looks good; the main dull green color scheme is still present, a little more grey color shows up on his thighs, hands, and arms, and some yellow accents are now present. He also has some silver paint on his ridiculously large feet (seriously, this guy could be the next Ronald McDonald) as well as some silver paint on his chest with a red Autobot symbol. What I do like about the robot form, is after shifting the hood/top of the car over his shoulders, a chest design shows up that is very indicative of his G1 appearance. It�s an incredibly nice touch without having that particular design anywhere in the truck mode. Kup also has nicely molded arms, though the door panels get in the way quite often, and the front wheels are now positioned on his shoulders. Unless I missed something on my Kup, the wheels never lock into place in robot mode. This is only problematic when you�re moving his arms around and the wheels seem to go everywhere they go. Kup has a fantastic head mold, and it�s interesting to see his mouth is open, which is something very few Transformers have. One part I�m not too keen on is Kup�s lower legs. They seem a bit long for the rest of his body, and it makes him somewhat disproportionate. It�s not so bad as to look goofy, but the legs are just a touch long. Overall Kup definitely looks the part. For movement and positioning, Kup has quite a few joints. The arms and hands have 5 joints collectively, and the legs have 4 joints from hip to ankle. His head is on a ball joint which allows for some decent movement. One downside is the lack of a waist joint, but he�s got enough other joints to make things work well. His feet (as mentioned above) are rather large, but this allows for great balance. I haven�t really encountered any balance issues with him so far. 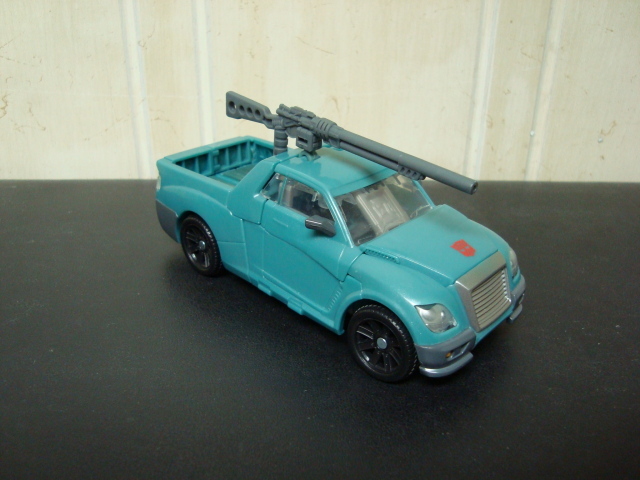 For accessories, Kup comes with his trademark laser musket, and it�s a very fine weapon. It features a C-clip, which can be plugged onto any C-clip on any other Transformer from the recent lines. Kup has two C-clips on each forearm panel, which can allow for some decent musket-steadying positioning. The musket handle is a standard 5 mm peg. Kup�s hands are molded open, but they fit 5 mm weapons really well. Overall I think Kup has a very solid robot mode in many aspects, and he�s a great update to a major character. Transformation: 7. It�s simple, but trying to get the door panels back in to vehicle mode is a chore. And there�s one tab on the hood that is a pain to work with. Other than those things, it�s rather fun! Durability: 9. I don�t see any quality issues with Kup. Fun: 9. He�s got a good ability for poses due to large feet, a nice weapon that can be store or clipped on in several places in both modes, and a working tailgate. What�s not to love? Aesthetics: 8. 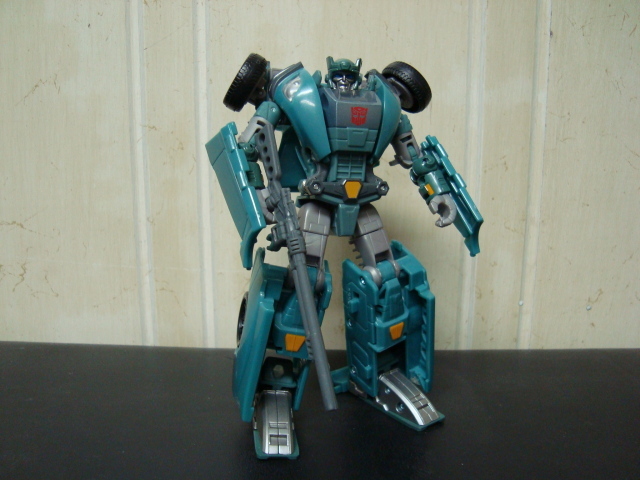 Kup looks great in both modes, though the color is a bit dull. His head mold is done very well, and he�s well detailed. He is a bit long legged though, which gives him a slightly odd proportion in robot mode. Articulation: 8. There are plenty of joints to be found, and there isn�t any big hindering spots to his movement. Value/Price: 9. If you can get him at retail he�s rather inexpensive and there�s quite a bit you can do with him. Overall: 8. Kup isn�t a perfect Transformer. However, he is a very solid toy and definitely worth picking up if you liked the character. There can be some fun things to do with him, so he�s a good value as a deluxe sized figure.